Wow, what a month Gareth Southgate's men gave us! Even the sun shone throughout. In so many of us, hope and expectation swelled to fever pitch. It was a summer love affair - intense, passionate, all too brief, ultimately heartbreaking - but leaving indelible memories for every England fan. For a while life was so much better than usual, and whole communities shared the joy, and the pride. 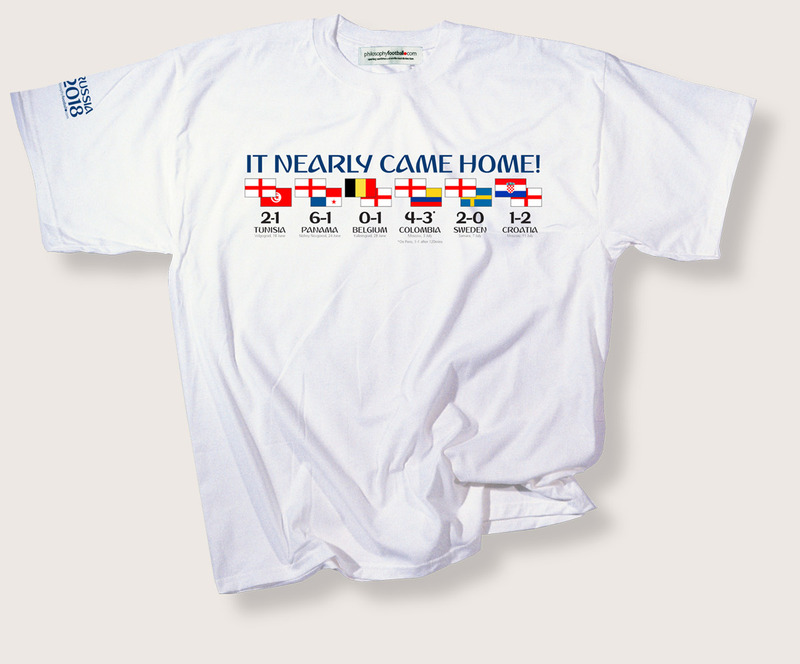 To mark an unforgettable tournament we offer our commemorative T-shirt, showing all England's match details in turn. Kane's injury time tonic against Tunisia, the romp against Panama, the nail-biter versus Colombia, a smooth passage past Sweden, and the final stomach-churner against Croatia. It's all there in full colour. Hard-wearing, we just hope that durability won't be needed for a 28 year wait until the next campaign of this intensity. Available in unisex size XXL (52inch/130cms)..